When planning an event it should be a goal to have everything prepped ahead of time, including the meals. While some parts of the meal simply can’t, there are some parts that can be made ahead of time. If possible, try planning the meal so that many parts of the meal are those that can be made the day before, this way you have time to relax the day of the event. One such part that can almost always be made ahead of time is the salad. Some people avoid bread during the summer time, not me. If, like me, you gravitate toward the richness of bread soaked with a salty, tangy vinaigrette, you’ll love this. I like to use a slightly tart sourdough bread and one of my favorite red wine vinaigrettes (which works with many other salads) and toss them and the juicy tomatoes with charred red peppers, capers, and a handful of briny black olives. If you’re expecting friends for dinner later in the week, you can start right now to prep this summertime bread salad. Make the vinaigrette and keep it in a jar in the ‘fridge for up to a week (I always hope it’s still there when it’s time to make the salad. If my kids or husband spy it, they are apt to sprinkle it on greens and sandwiches all week long). You can roast the red peppers two or three days ahead of time and even toast the bread up to two days before using. Keep the bread cubes in an airtight container until you need them. The day before you are going to put the salad together, prep the tomatoes and olives — if using. Finally, make the salad up to 3-4 hours ahead of the meal; it just gets better over time. Preheat a gas or charcoal grill on medium heat, or preheat the broiler to char the peppers. You can also use the flame of a gas burner. Put the peppers directly on the grill or on a broiler pan, or hold with tongs over the gas flame and char on all sides, turning to blacken evenly. This will take 5 to 8 minutes in total. Transfer the charred peppers to a bowl and cover with plastic wrap for at least 10 minutes. Peel the peppers (do not worry if a little, blackened skin clings to the flesh) and then remove the stems and scrape out the seeds. (Do not do this under running water.) Cut the peppers into 1-inch pieces. Spread the bread cubes on a baking sheet and toast them for about 10 minutes or until light golden brown and crispy. 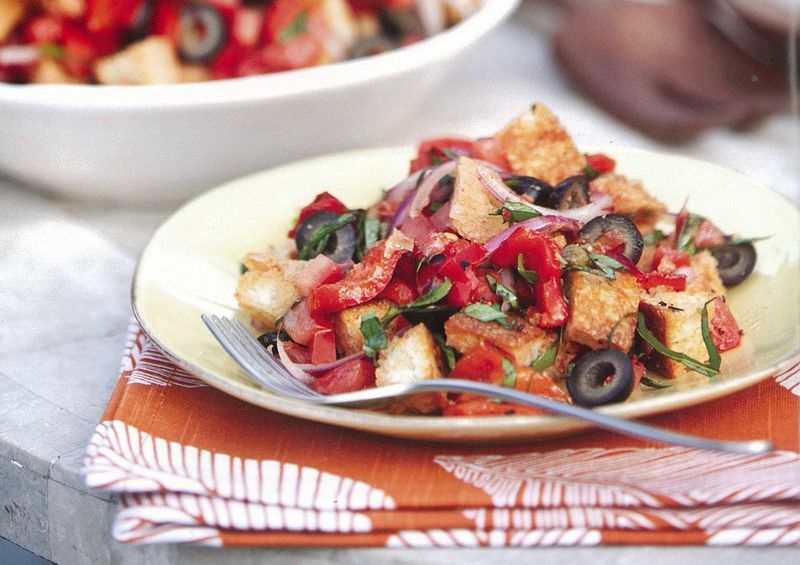 In a large bowl, mix together the toasted bread, charred peppers, tomatoes, basil, onion, capers, and olives (if using). Toss with the vinaigrette and season to taste with salt and pepper. Serve right away or let the ingredients mingle and mellow for up to 3-4 hours in the fridge or room temperature. Whisk together the vinegar, garlic, and salt until the salt dissolves. Still whisking, slowly drizzle in the olive oil until incorporated. Season to taste with pepper and serve. If not using right away, cover and refrigerate for up to 1 week. Shake or whisk well before serving.